Recording artist, performer, producer, inventor, Emmy-winning composer and music education advocate Mark Wood has spent the past four decades electrifying the orchestra industry. Dubbed The Les Paul of The Violin World by PBS, the Juilliard trained violinist (he attended on full scholarship) first turned the string establishment on its head in the early 1970s with his invention of the first solid body electric violin. His company Wood Violins is the premier manufacturer of electric violins, violas and cellos worldwide and he holds the patent for the first ever self-supporting violin. The company stands behind its claim to have made the most important change to the violin in 400 years and is often referred to as the Stradivarius of Electric Violins. With a design as stunning as their sound, Wood Violins pack both sonic and visual punch. Their premier electric violin, The Viper, has found favor with musicians as varied as Lady Gaga’s violinist Judy Kang, Carrie Underwood’s violinist Jimmy Herman, and Big and Rich’s violinist Shawn Bailey. 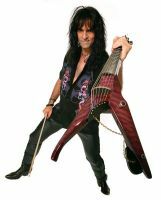 Wood is a world-renowned performer who rose to fame as string master and founding member of the internationally acclaimed Trans-Siberian Orchestra. A successful solo artist in his own right, Wood writes and records original music for film and television, has released six solo albums, and tours with his band The Mark Wood Experience (MWE) which features his wife, vocalist Laura Kaye, and their drummer son Elijah. His commission credits include The Julliard School and extensive TV broadcast music including The Winter Olympics and his Emmy Award-winning compositions for The Tour de France. In addition to his continued solo and commission work, Wood has collaborated with and appeared alongside some the biggest names in music such as Lenny Kravitz, Celine Dion, and Kanye West. As a member of his touring band, Wood had the honor of performing with the legendary Billy Joel for both historic final concerts at Shea stadium, sharing the stage with Paul McCartney, Steven Tyler, and Roger Daltry. He also starred in a Kanye West produced national Pepsi TV commercial and has appeared on the world’s most venerable stages including Carnegie Hall, Lincoln Center, and Madison Square Garden. Mark has found a true passion for music education. His program Electrify Your Strings (EYS), now in its 10th year, is an intensive rock and roll workshop for school music education departments that boosts student self-esteem and motivation and helps raise money for music education. Today EYS visits upwards of 60 schools per year and there is a waiting list of schools wanting to participate. The organization has been featured on <>The Today Show and CBS Evening News and in countless local media outlets. But for Mark, it is all about the kids. He is dedicated to providing educators with the opportunity to ignite their student’s passions and to inspiring students to open their minds and unlock their potential. His book Electrify Your Strings: The Mark Wood Improvisational Violin Method (published by Cherry Lane) is regarded as the definitive electric violin method book. The first in a series of forthcoming educational books, Wood is passionate about providing educators and students with the tools they need to succeed in the classroom and beyond. With more than a hundred thousand students reached, millions of dollars raised to help high school music departments across the US, and dozens of school orchestra programs saved from the chopping block because of funds raised through his efforts, Mark Wood has proven himself a man of ideas, action and results. Showing no signs of slowing down, the multi-faceted visionary continues to write, perform, record, invent and inspire. As a matter of fact, Mark Wood is just getting started. A genuine family man, Wood runs his operations alongside his wife, business partner, and longtime collaborator Laura Kaye out of their home in Port Washington, New York. Their son Elijah recently enrolled in New York’s prestigious Professional Children’s School, which allows him to tour with EYS and The Mark Wood Experience year round. 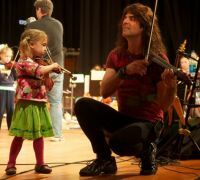 In addition to EYS, Wood and his family run the annual Mark Wood Rock Orchestra Camp and the Mark Wood Music Foundation, a 501(c)(3) dedicated to providing music scholarships.